Availability: Estimated to ship in 2-4 weeks. 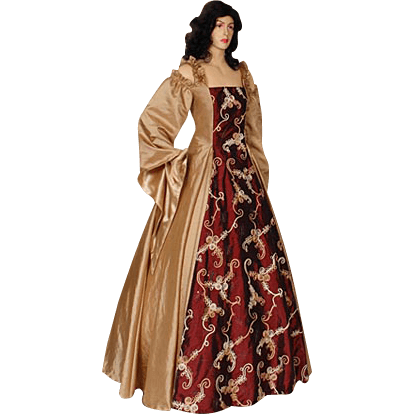 Made from elegant, shimmering taffeta fabric, the Gold and Burgundy Renaissance Dress is a lovely ensemble that is perfect for the woman who likes style and color. This dress fastens via laces on the back and is adjustable to fit your body-type. As this dress is made from taffeta, it behaves in a way that is quite similar to silk. It is soft and luxurious, and it even shimmers faintly in the light. The front of this dress is predominantly burgundy taffeta that has been embroidered with a gold-colored floral pattern, while the rest of the dress is made up of simple gold taffeta. The shoulders are a split design, creating a frilled gold shoulder-strap and the frilled gold hem of the sleeve. The sleeves are full-length and wide, having been designed to hang off the wrists. 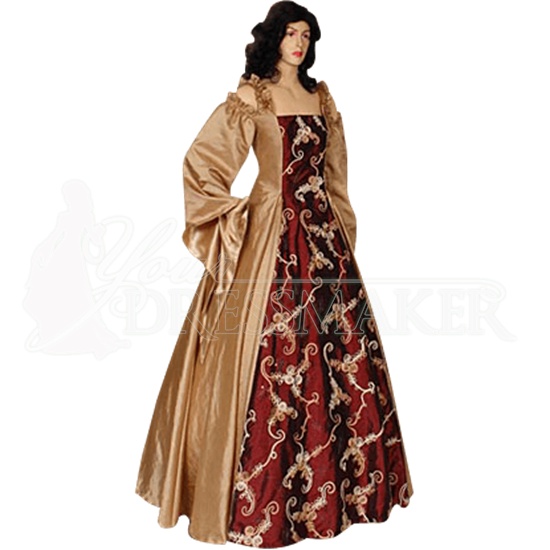 The Gold and Burgundy Renaissance Dress is pictured above with a petticoat to give it shape, although a petticoat isn't included with the dress. If this particular shape is desired, then a petticoat or hoop-skirt can be purchased separately, although the dress can also be worn just fine without one. If you are looking for a simple and yet elegant dress to wear, then look no further than the Gold and Burgundy Renaissance Dress! It looks great at medieval Reenactments, Renaissance fairs, and all manner of other events.